IIED has documented social and environmental change in the village of Dlonguebougou in central Mali. The research has examined transformations to land use, people, and livelihoods in this dryland region over 35 years. Dlonguebougou, a rural community in the dryland region of central Mali, has experienced significant change in the last 35 years. This project completed by IIED senior fellow Camilla Toulmin in the village where she carried out her doctoral fieldwork from 1980-82, explored growing pressures on land, shifts to farming systems, increasing scarcity of pasture, and rising tensions between herding and farming groups. The study showed increased growth and diversification of assets (livestock, wells, shops, solar panels…) alongside growing reliance on migrants' remittances to make ends meet. A combination of field-level enquiry and satellite imagery was used to understand the cause of increases in land pressure, and engage with the population on how they might develop more sustainable patterns of land use. Rainfall data over the last 35 years show the increased variability, and incidence of extreme events. Poor harvests are partly the result of shorter rainy seasons. Soil fertility and labour invested in weeding are other major factors that explain which families get a good, or bad, harvest. Taking a wider landscape approach allowed an understanding of the impacts of national policies on the village, and its region. The government has promoted the expansion of irrigated sugar-cane some 40km away, by leasing out land to large-scale investors. These schemes have evicted hundreds of farmers who migrate, seeking new land to farm in Dlonguebougou's customary territory, creating land shortage and growing conflict. The research also asked whether the new agricultural land law could bring stronger rights to rural communities, such as Dlonguebougou. Surveys and interviews were used to compare population numbers, patterns of settlement, and household organisation since 1980. The research demonstrates the continued significance of very large domestic groups. These households combine being a farming business, providing for food, shelter and raising of children, and offering a way in which people protect themselves against the risks of illness, and old age. 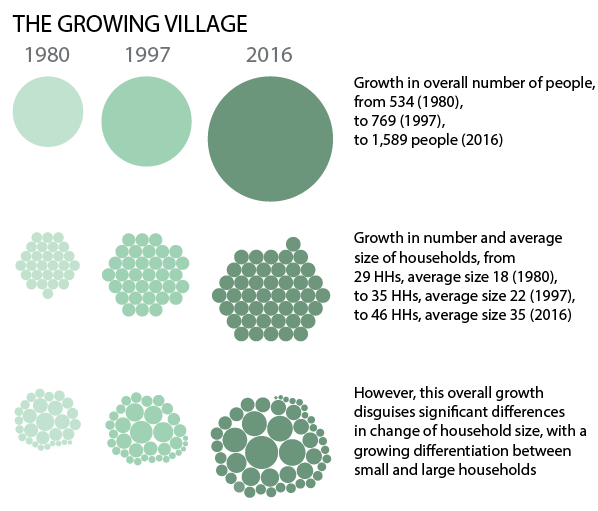 The average household size in Dlonguebougou is now 33 people, a doubling since 1980, with more than 100 people living and working together in some of the largest domestic groups. These are remarkable social organisations, which remain very strong in Dlonguebougou, despite being in decline in many other West African rural communities. Interviews with migrants who have left the village to go and live in the capital Bamako provided insights into decisions to try a new life elsewhere, and the continuing importance of their village-based roots. Changes in assets, consumption patterns and broader livelihoods were explored through a range of methods, and show a large increase in disposable income, and major investments in solar energy. As in many other parts of Africa, mobile phones have become very widespread. The figure below shows the big increase in solar panels, over the period 2000-16. Other significant transformations over the last 35 years include the abandonment of customary religion and the building of a mosque, the building of a village school and clinic, and the establishment of elected local government. Outputs from the research will include a book on 35 years of change in the Malian Sahel, and two journal articles on land use change and the significance of large household size as a risk-sharing mechanism for Sahelian communities.